I’m very pleased that my Robert Benchley Society Humor Award has generated a fair amount of publicity. This article in Gannett’s Journal News is probably the best of the stories. And it has a fun companion video of me reading one of my humor columns. Well, I’m now beyond thrilled because Bob Newhart, the finalists judge, picked me as the FIRST PRIZE winner. 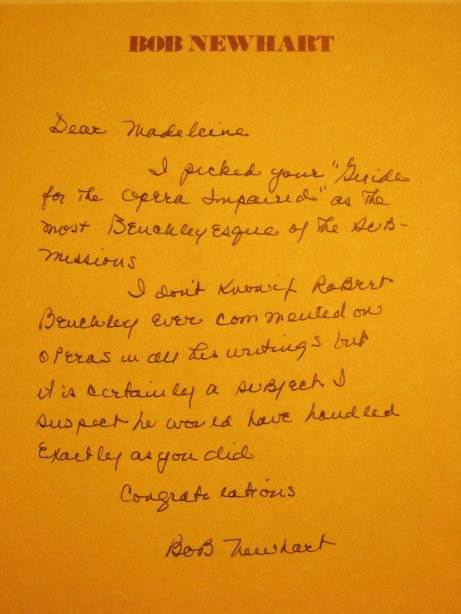 Mr. Newhart even sent me a handwritten personal note (reproduced below) explaining why he named me for the top Robert Benchley Society humor award. Right now I’m verging on euphoria —a dangerous condition for a satirist. But just to be mentioned in the same sentence as Mr. Benchley and Mr. Newhart is almost beyond comprehension. UPDATE: I’m very pleased that my award has generated a fair amount of publicity. This article in Gannett’s Journal News is probably the best of the stories. And it has a fun companion video of me reading one of my humor columns. I’m a 2008 Robert Benchley Society Award for Humor Finalist. Newhart’s selection and ranking of the top four winners for this year’s Robert Benchley Society Awards will be announced the week of July 6th. Will I win the top prize? High anxiety! You are currently browsing the archives for the Robert Benchley Society category.